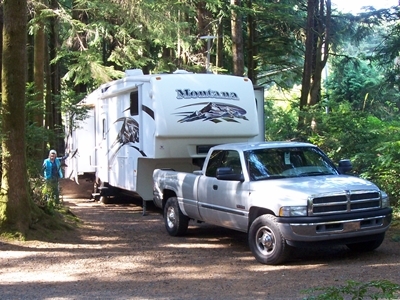 Our first stop on the Oregon coast was Barview Jetty Campground a Tillamook County park that we have considered as a possibility for work camping. It is located on the north jetty of Tillamook Bay just south of the city of Rockaway Beach, Oregon. Many vacationers stop at the Tillamook Cheese Factory on their way north to Cannon Beach / Seaside or south to Depoe Bay / Beverly Beach and miss the beauty this area has to offer. Many do come for the excellent fishing and crabbing that is found here. Oceanside is a small town due west of the city of Tillamook where I remember going numerous times as a child. Of course we had to go see it while we were here. I recognized the motel where we used to stay though it has changed quite a bit with a new facade facing the road. The beach and rocks were just as beautiful as ever. Just a few miles down the coast is the small town of Neskowin. A very pretty and quiet place where we foolishly took no time to relax. Took a trip up to Pacific City but did not find much there other than a nice very large beach which we would have enjoyed more if it had not been so cold and windy. We went see Depoe Bay (the world’s smallest navigable harbor), and the D River (at only 120 feet from Devils lake to the Pacific Ocean) the world’s shortest river. Whereas I did find a nice shot of the bay, I simply could not get an explanatory picture of the river. Traveled to what I consider my hometown, Corvallis Oregon, to catch up with Stephen, my older brother. Had lunch with Stephen and a great time reminiscing through the afternoon. I will definitely try harder to stay in touch and can’t believe I did not get his picture! We had already stopped at my stepsister Julie’s where we were treated to rhubarb muffins, coffee, and an awesome catch-up on life in Corvallis. One of my stepbrothers, Kip came over just to see us and added greatly to the party. We were very privileged in all our enjoyment that day!! Well here we are just south of Florence, Oregon. This is a very nice heavily wooded park where we spent a little extra time recuperating. Caught up with the laundry, except for a few things that Elaine had stashed in the basement and forgot about until she wanted to wear them and then could not locate. This vacation stuff is too strenuous! 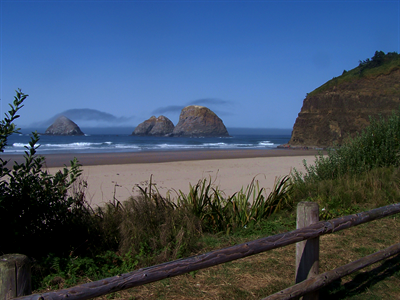 Florence is located at the mouth of the Siuslaw river and the bay is yet another Oregon paradise for crabbing, steelhead, salmon, and rock (cod, perch, sea bass, flounder) fishing. Old Town has a fine selection of tourist shops and galleries that make for a fine days shopping. The weather was again great so we strolled on the docks and caught site of a playful harbor seal doing the backstroke. Look what Gordon found! These are the first of 2 batches of wild mushrooms that he harvested. Talk about good fortune, these were just beginning to show while we were there. I collected about 1 1/2 pounds of chanterelles and at least 4 pounds of the lobster mushrooms. We did eat very well!! I sauteed and froze the chanterelles that we did not eat fresh. I sauteed some of the fresh lobster mushrooms for one dinner and dried the rest for later. What a surprise bonus for our trip. Bandon is a very popular resort town on the southern Oregon coast. There are lots of beaches, shops, hiking, golfing, and sightseeing here, but we are here because we have many happy memories of past trips and it is the center of the myrtle wood industry. I never pass up a chance to look at wooden crafts or to shop for wood. We spent most of a day going to various myrtle wood companies. Yes, I bought some more wood. I found some very nice pieces including some spalted boards. We also found some more antique / junk stores and another place that sold wool and yarn. So we shopped and gawked like normal tourists. Can you see the beautiful woman gazing into the heavens? 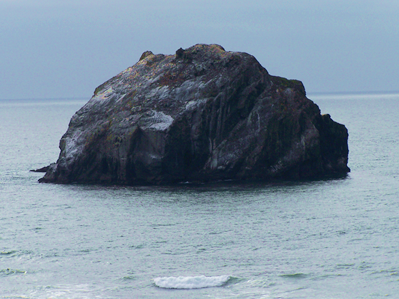 This is Face Rock, it is one of the must see sites in Bandon. 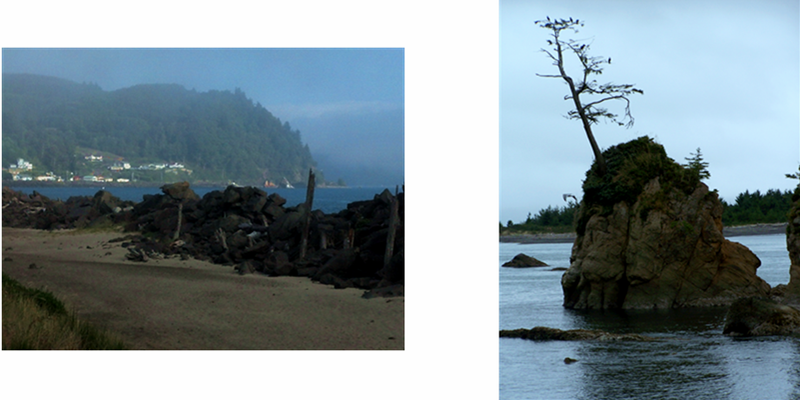 The coastal Indians consider this to be a sacred and powerful place. Bandon is a land of many wonderful accessible beaches. We ate fish and chips at a small dockside restaurant and in general had a great time at our last stop on the Oregon coast for this trip. Now it is off to the Medford area to catch up with some old friends. We parked in a pleasant site under the signature tall evergreens of Washington State. With salal, rhododendron, blackberry, fern, cedar, fir, pine, alder, and more all around us the green lush forest above hoods canal is wonderfully peaceful. We spent a number of days here reacquainting ourselves with an area that we camped in regularly when we lived in Steilacoom. Several rivers flow into the Hood Canal basin including the Skokomish, Hamma Hamma, Duckabush, and Dosewallips to name a few. This approximately 65 mile long fjord is a marvelous place for fishing, hunting, hiking, boating, skin diving, picture-taking, and just plain living. The classic concrete arch bridges at the Hamma Hamma are to me an illustrious image of the Hood Canal area. While here we were able to meet up with Elaine’s brother Phil and his wife Anette. We had lots of catching up to do as it seems our schedules always seem to clash. It was a perfect day. We were fed a peasant lunch of cheeses, smoked salmon, and crackers (ha, peasants should have it so good) on their deck overlooking Ludlow Harbor. After lunch they took us out onto the canal in their boat. The weather cooperated providing us with an awesome view of the area that we land yachters don’t often get. Afterward I got a tour of Phil’s shop while Anette gave Elaine a tour of her gardens. As if that wasn’t enough it was time for a dinner of dungeness crab cocktail, wine and herb poached salmon, roasted veggies, and potatoes. We should never let it be so long between visits. From here we will be headed to the Oregon Coast! We made it! After spending one night at Pacific Holiday RV Resort just north of Long Beach, Washington we drove 5 miles south and arrived at Cape Disappointment State Park just west of Ilwaco, Washington at the mouth of the Columbia river where we are camp hosts for the month of August. This was home for a month. From thankful campers we received gifts of home grown tomatoes and super yummy fresh crab. We also got to know campers who felt that someone should remove the dead wildlife from the beach. Life is fun and at times funny. There are two lighthouses here on the north side of the mouth of the Columbia river. The Cape Disappointment Lighthouse completed in 1856 and the North Head Lighthouse completed in 1898. The North Head Lighthouse was added because ships approaching from the north could not see the Cape Disappointment Lighthouse. 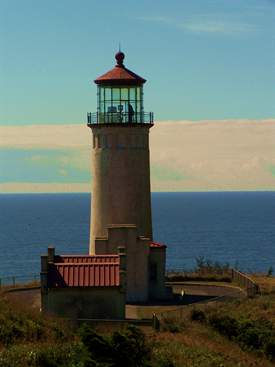 The first order Fresnel lens was moved 2 miles from Cape Disappointment and installed at North Head. A smaller forth order Barbier and Benard lens was then used at Cape Disappointment. Both Lighthouses are still in use though the North Head Light is in poor condition due to its having been sealed up to reduce maintenance. It was sealed for a number of years so that the natural ventilation that was a part of the original design did not occur and the excess moisture has caused the mortar that holds it all together to weaken. Open to the public and staffed with volunteer interpreters the North Head Lighthouse is one of the major attractions of the park. The beautiful view from the top is definitely worth the effort! When Elaine’s sister and brother in law visited us we spent a very nice day exploring and reminiscing. Grandmother Margie had a cabin on the Longbeach peninsula so Elaine and Nanette both have many memories of the area. We were able to finish our day together with a fresh crab salad. This is what camp hosts do to be useful. Actually we had a whole list of things we could do to help out. 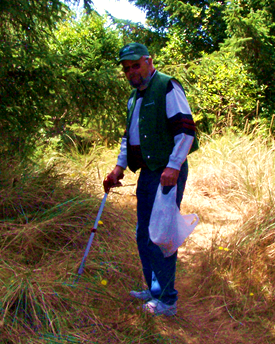 Mostly we took the easy way out and cleaned up campsites and picked up litter on the beach. We also answered a lot of questions and assisted campers and the park rangers. We had an option to sell firewood which would have paid real money but we declined because we were afraid it would interfere with our evening relaxation (happy hour). 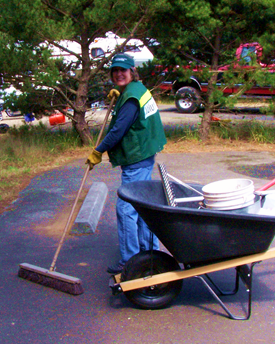 The Lewis and Clark Interpretive Center, with it’s volunteer hosts is a must see attraction. 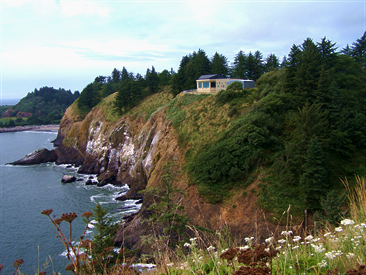 It is set atop a bluff overlooking the mouth of the Columbia River just across Dead Man’s cove from the Cape Disappointment Lighthouse. You will walk a time and distance annotated trail that will give you a real sense of the breadth and importance of this famous exploration. The exhibits including artifacts, documents, and art will bring your trek to life. There is also a nice gift shop and a small maritime museum with an awe inspiring view to make the side trip worthwhile. 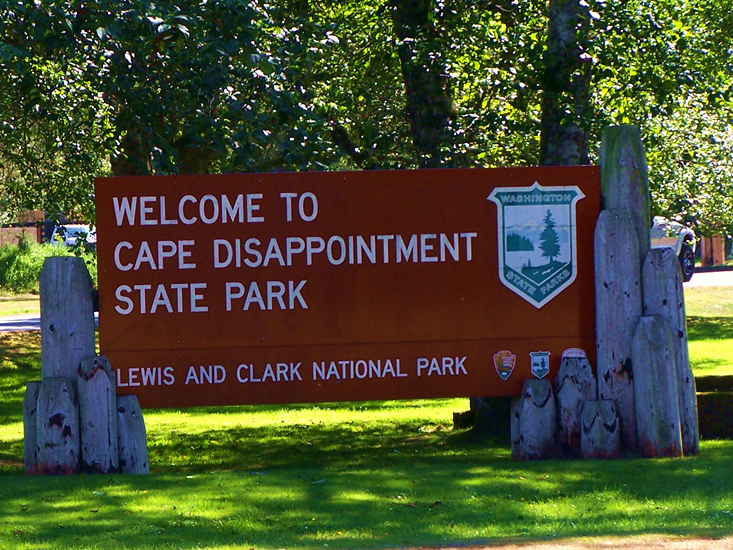 A beautiful place with a nasty name between The Cape Disappointment Lighthouse and the Lewis and Clark Interpretive Center. Three views of Beards Hollow, from the top of North Head Lighthouse, a tunnel of trees, a first order Fresnel lens, a gun battery, the mouth of the Columbia, and another view of Dead Man’s Cove. Patterns Drawn In The Sand By Wind, Tide, And Waves That I Call Sand Forests. We saw many things, captured many memories, took lots of pictures, saw some interesting things at craft fairs, met some wonderful people, and best of all had a great time. This picture of a young bird resting momentarily on one leg reminds me of the peace and serenity at Cape Disappointment. We weren’t disappointed.